On Dean street right by Freddy’s I found this “installation” of Swoon’s pieces (sadly painted over, by a rival artist? Someone who wants to ‘clean up’ graffiti and street art?) and “Celebrate Peoples History” Posters. I thought the blue wall offset the wheatpasted prints really nicely. 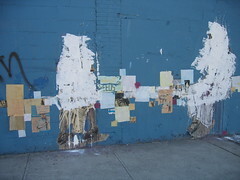 Seeing these pieces, despite the ghostly white paint, brought me back to 11 Spring, which also featured the character on the right.